Today we celebrated Thanksgiving, which is a holiday bound in tradition for me. And much of that tradition involves food. Not just the eating of it, but the preparing of it, the serving of it, and the discussing of it. I love that we have this holiday which centers around spending time with family and friends, and about sharing a meal with them. Thanksgiving always leaves me full of thanks and of food, but also of nostalgia. More than anything, I think of Thanksgivings past at my grandmother’s house. I remember setting the table with the special china, fancy glasses and candlesticks. I remember being shooed out of the kitchen so my grandmother could manage the entire feat of feast-making in her own way. (Also because her kitchen was tiny, and she didn’t want us in the way.) I remember enjoying so much of the feast when it came time to eat, pretty much loving all of it, except for the dreaded liver lumps in the gravy. (My grandmother would cook up and dice up the giblets, and toss them into the otherwise smooth and tasty gravy.) And I remember the extended time in the kitchen after the meal, typically with one or two other family members, hand-washing and hand-drying all of the dishes from the meal. (Because my grandmother’s house did not have a dishwasher. Also, my grandmother was happy to get out of the kitchen at the end of the day.) I usually got the job of drying. I can still remember the feel of the dishtowels in my hand, typically linen and worn rather thin from years of use, and getting more and more damp until finally you had to get out a fresh dry towel. I spent much of yesterday and most of today preparing food and preparing the space to eat that food. (Our dining room had gotten rather buried over the past 8 months or so, but I was bound and determined to unearth it.) We had a few guests (my mother-in-law, and a friend and her 2 kids), so there were eight of us. In spite of the moderate numbers, we had an immoderate number of food items on the menu. Some of the dishes I prepared: roasted root vegetables, roasted butternut squash with shallots and cranberries, roasted dijon cauliflower, and vegetarian stuffing. My plate. The plate itself is from our good set, a pattern that John and picked out when we had our wedding. I love using the good china for special holiday meals, because that is what we always did at my grandmother’s house. As for the food, the plate holds the 4 dishes listed above, plus green beans, mashed potatoes and vegetarian gravy, and cranberry sauce. Pumpkin pie. The dairy-free version that has become a tradition for me. I had delusions that I would have time to also make something like an apple crisp. Ha. Now that the day is done, and I’ve turned in for the night, I am still feeling full from the feast (which was blissfully free of liver lumps). I am also feeling full of thanks for the bounty of our feast, for our comfort and safety, and for the people in my life who make my life so full. This post is half-baked because I just spent far too longer organizing and deleting photos in order to do a new photo import to my laptop, because I’ve gone and filled up my hard drive yet again. I’m too tired tonight to write, and am turning in early. I had an extra 3 children last night and today, and am feeling a bit fried. 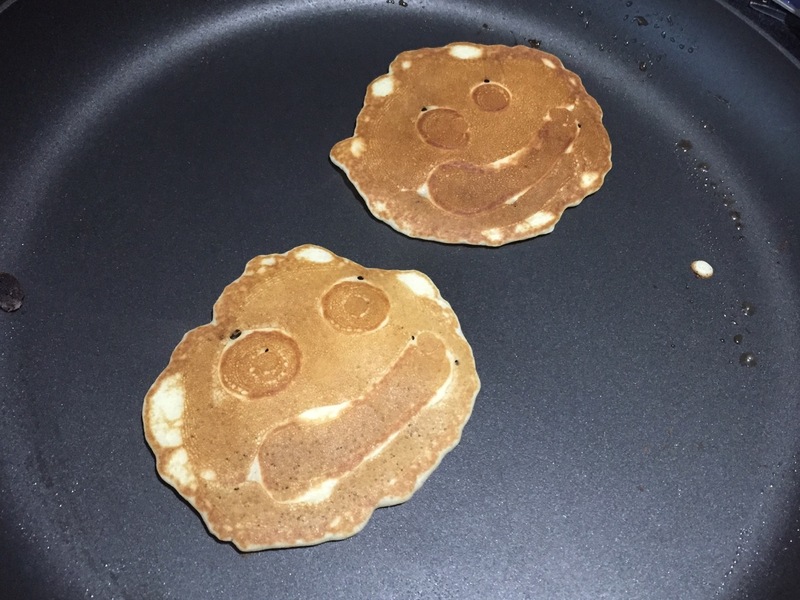 Instead of anything of substance, here is a photo of some of the pancakes I made this morning. I’m on a roll with my ducks these days. Not that I have any actual ducks. I do, however, have plenty of photos of ducks. This photo is one that strikes me as funny, probably because it’s not a sight likely to be seen in the US. I saw this display of duck heads on my trip to China in 2012, at a food stall. I believe it was in the city of Hangzhou, which is near Shanghai. Most Americans prefer to dissociate the meat and poultry they eat from the animals they come from. Typically, these purchases are made in a supermarket, with cuts of meat and poultry wrapped in cellophane, denuded of as many signs of having once had feet and faces as possible. Clearly this is not the case in many parts of the world. I still remember being somewhat shocked as a kid when we moved to France, and encountered butcher shops and market stalls with whole animals hanging from hooks, and being disturbed that the chickens we purchased still had feet and head attached. 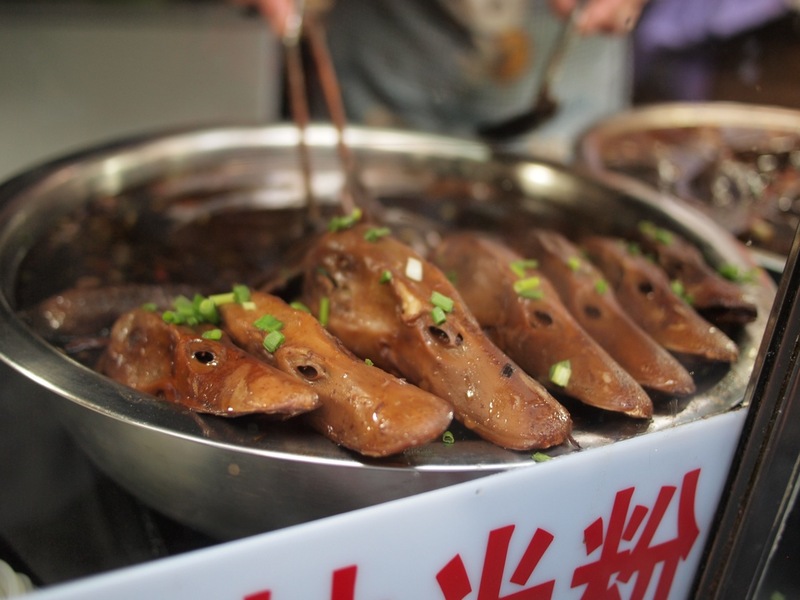 In any case, it seems that in China, duck heads are a fairly popular food dish. It has become a tradition for me to bake gingerbread in the winter. 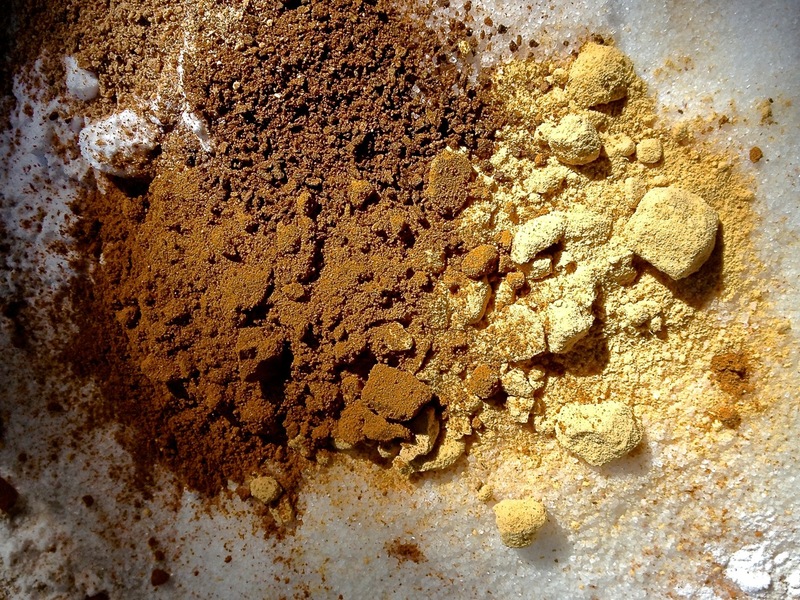 On more than one occasion, I have been quite taken with the way the various dry ingredients compose themselves the bowl: the various spices making dark patterns on the lighter flour mixtures. 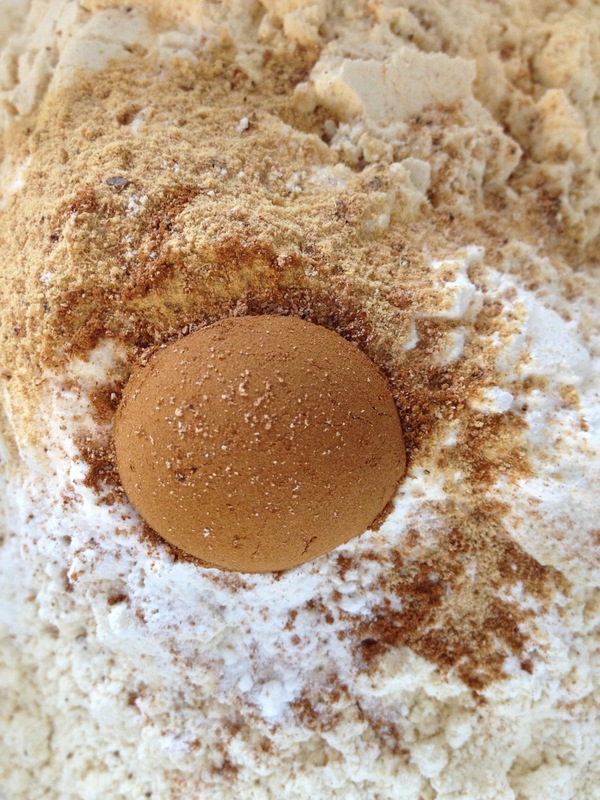 Here are photos from three different times I made gingerbread in recent years. Here, I seem to have added the spices from lighter color to dark, with ginger, then cinnamon, then cloves. 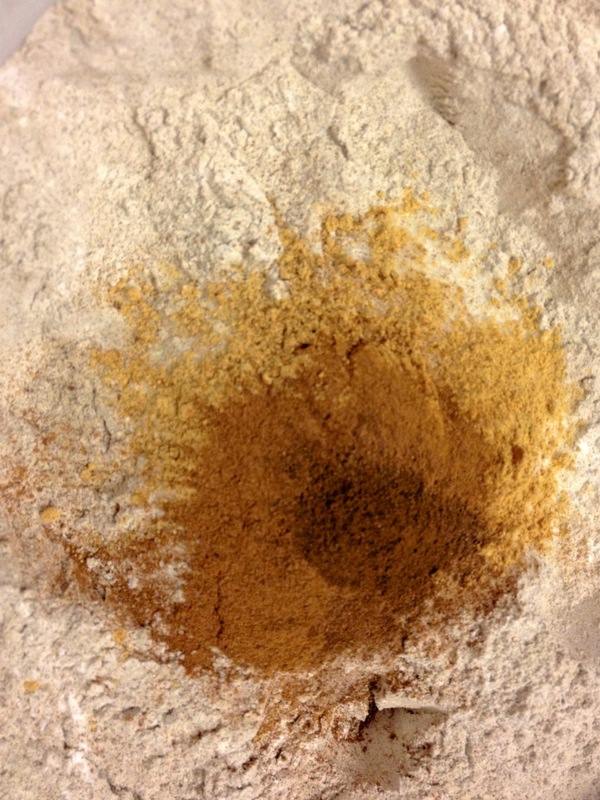 Here, the spices clumped up, looking like miniature boulders on a bed of sugar gravel. Here, the cinnamon perfectly held the shape of the measuring spoon.